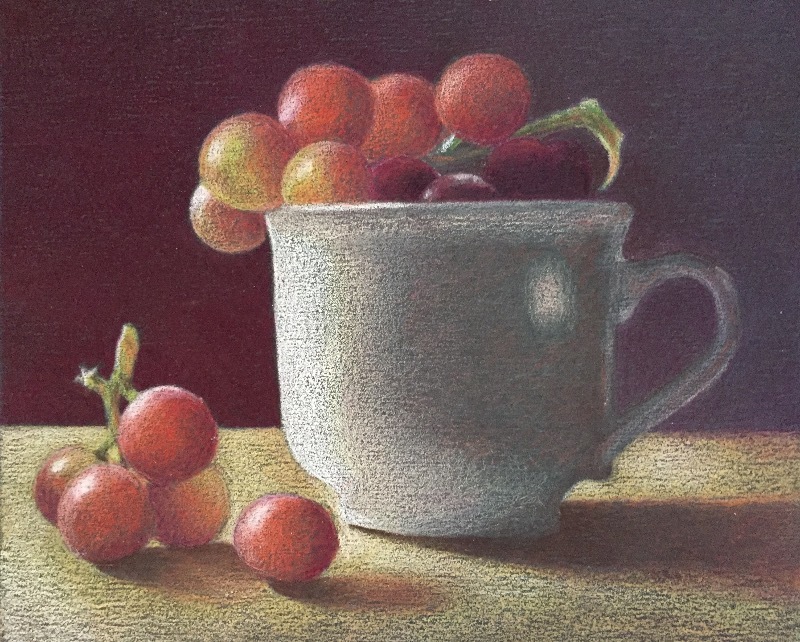 If you haven't yet tried colored pencils on sanded pastlebord, you simply have to try it! It's a whole new world! Working on a sanded surface is fast, forgiving and fun because there’s little layering and the light colors can be put right on top. Artist Nicole Caulfield shows you how with very clear, easy to follow instruction and 7 demos. We know you will love this one! Printed in the USA. Publish Date: 2008. Love the nice customer service touch - adding tissue paper wrap and a candy cane. I miss gauged what a 5x7 size board would look like, it was a wee bit small, but I can see the wisdom in starting out small with a new to me support. First time using a gray tone support - loved it! You can really see your values once you get going. The project is fairly simple and I completed it in an afternoon. I like how it looks like an pastel or painted look. The big negative for me was the instructions. They were incomplete in section 2. The written instructions were good and it was helpful to have a demo picture as it correlated to the written instruction BUT section 2 was lacking. You didn't include a picture of 2a, 2b, 2c. I was left to guess. It wasn't enough of an issue to send it back, but I was disappointed in that it was missing sections. Perhaps mine was a faulty kit? I see one reviewer made a mention of this too I eventually just looked at the reference photo for help. All in all I liked it. I'll invest in Ampersand pastelbord in the future, it's really nice. Hope future issues of the magazine cover this support. Hi Peggy, I'm glad to hear you enjoyed the project, and thank you for your thoughtful feedback. We've updated the step 2 image to include labels to identify the A, B and C sections of grapes as the step is broken down for each cluster. We really appreciate the review, and your feedback will help other artists have an easier time with the project. Best wishes. packagingwith lollipop and wraping paper touched me deeply. So thoughtful andkid. We love to treat our customers to a little something special! CP is a wonderful gift, after all. Thank you for the kind review, Rosemary. First time doing a tutorial. It was very easy to follow! I purchased the downloadable kit. The instructions were well written and simple to follow. I'm a beginning artist but I was able to complete the drawing following the guide. The end product looked great. I highly recommend this site. Thank you for taking the time to submit your review! We appreciate it very much and are so happy you've enjoyed this project kit, Elena. Happy Coloring! I did not use the sanded ampersand board. I bought it to try but thought it would devour my pencils so used Dahler Roney Gunmetal grey. Had never used it before either but was closest to color if the ampersand. Will probably not use it again...lots of grainy surface texture. My favorite is Stonehenge. Anyway, back to design. Instructions very well done until the very end. Almost like the last page missing for final shadings on grapes. Not hard to figure out though. Overall I'd say an A- only because of no final grape shading. Will leave it overnight and see about a few corrections then.